In this well-known resource, leading tire model expert Hans Pacejka explains the relationship between operational variables, vehicle variables and tire modeling, taking you on a journey through the effective modeling of complex tire and vehicle dynamics problems. Covering the latest developments to Pacejka's own industry-leading model as well as the widely-used models of other pioneers in the field, the book combines theory, guidance, discussion and insight in one comprehensive reference. 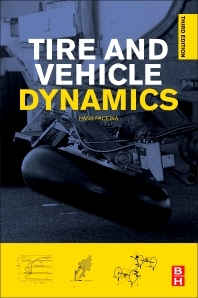 While the details of individual tire models are available in technical papers published by SAE, FISITA and other automotive organizations, Tire and Vehicle Dynamics remains the only reliable collection of information on the topic and the standard go-to resource for any engineer or researcher working in the area. Automotive engineers and analysts using tire models to simulate vehicle dynamics; Tire engineers, chassis engineers, vehicle dynamics engineers; Graduate students and researchers working on tire and vehicle dynamics; Aeronautical engineers working on landing gear. Hans' areas of expertise include theoretical and experimental research on the dynamics of road vehicles and on the mechanical behaviour of pneumatic tires, and Bond graph modeling of dynamic systems. Professor of Vehicle Engineering at the Delft University of Technology. Editor in Chief of the journal Vehicle System Dynamics. Secretary General and President of the International Association for Vehicle System Engineering. Consultant TNO Automotive. It's not a book, it's the book for tires!